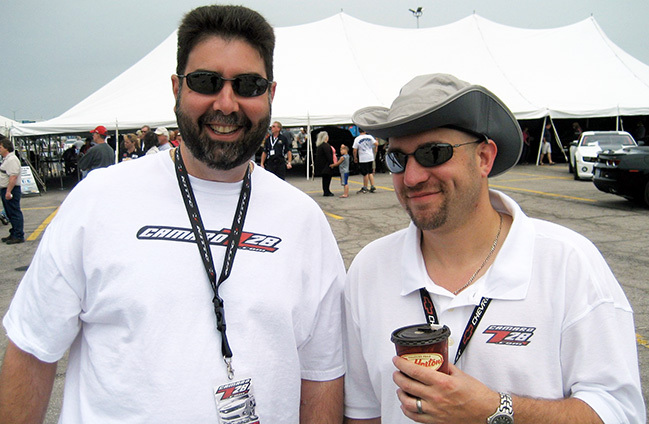 Chris Frezza and Jason Debler met at a Metro Detroit Camaro and Firebird race event in the summer of 1996. From their mutual interest in Camaros, they decided to make a web site about their cars. Basing the name on Chris’ 1995 supercharged Camaro Z28, the boys started CamaroZ28.Com. Little did they know that it would be the start of a revolutionary community that would pave the way for all other online Camaro communities to follow for years. As part of CamaroZ28.Com, Chris had an idea to begin a podcast supporting it, and thus the CamaroZ28.Com Podcast began in 2006. With both Chris and Jason hosting the show and covering all things Camaro, the CamaroZ28.Com Podcast rode high on the charts in iTunes with thousands of listeners tuning in each and every week. After 500 consistent episodes, the CamaroZ28.Com Podcast was retired and replaced with…the Camaro Show! The Camaro Show follows the same successful pattern as the CamaroZ28.Com podcast, and continues with the core fundamentals of bringing you, the listener, an automotive podcast in an fun and enjoyable format with humor, special guests, and of course, breaking Camaro news and editorial that no Camaro owner should miss. What are you waiting for? Tune in now!